Over 30 graduate students from Thunderbird School of Global Management descended on INTI International College Kuala Lumpur at the start of their 6-week study tour to understand the landscape, culture and best practices in doing business in Malaysia. The ‘T-birds’ as the students proudly call themselves, were from the No. 1 ranked school of international business in the US*. 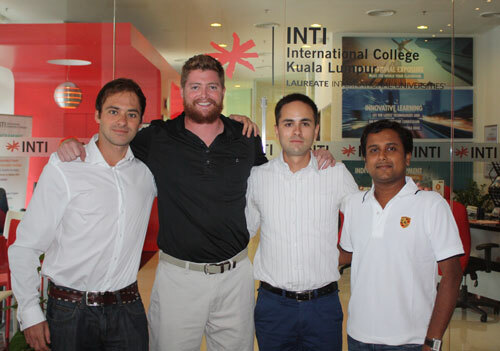 Marciniak (left) and del Granado (3rd from left) with fellow T-birds Matt McConaty and Venkatesh Srinivasaiah at INTI International College Kuala Lumpur. T-birds Nicolas del Granado and Jakub Marciniak were pleased that INTI was selected by their school to host the Thunderbird delegation. Respectively from Bolivia and Germany, the duo were appreciative of the experience gained by studying out of INTI’s city campus located in the heart of Kuala Lumpur’s business district and being hosted by friendly and helpful INTI staff and students. “The campus is conveniently located in downtown KL. This is certainly advantageous for working professionals whose workplaces are nearby and who want to acquire a higher qualification,” shared Marciniak, an MBA student. Utilizing INTI’s high tech campus facilities, the students were able to participate in lectures via video conferences in the auditorium, tap into INTI’s library resources and conduct group project discussions in the conference rooms available. They also enjoyed the opportunity to engage in cross-cultural discussions with INTI’s students and network with local entrepreneurs during a meet and greet session. INTI’s broad links with industry also meant that the students had access to corporations like MDeC, IBM and Accenture which they visited for an understanding of different business operations and their requirements of graduates. “I wanted to discover Malaysia’s key success factors in broadening its economic base. MDeC provided the insights I needed as the organisation’s representatives not only explained the work that is done there but also shared the success factors that have helped Malaysia become the success story it is today,” said del Granado. The study tour is part of the Thunderbird graduate programme where students are encouraged to travel during the course of their studies to enhance their global views on international business and management issues. The tour also gives students real life exposure to the landscape of local markets in different countries to help them make proper evaluation and research for their thesis and assignments. The T-birds’ learning experience also extended to the opportunity to enjoy Malaysia’s cultural heritage and explore parts of the country. Some also took the opportunity to travel around Southeast Asia. A characteristic true of a Thunderbird student, according to del Granado, is the enthusiasm for travelling, exploring and experiencing new cultures.